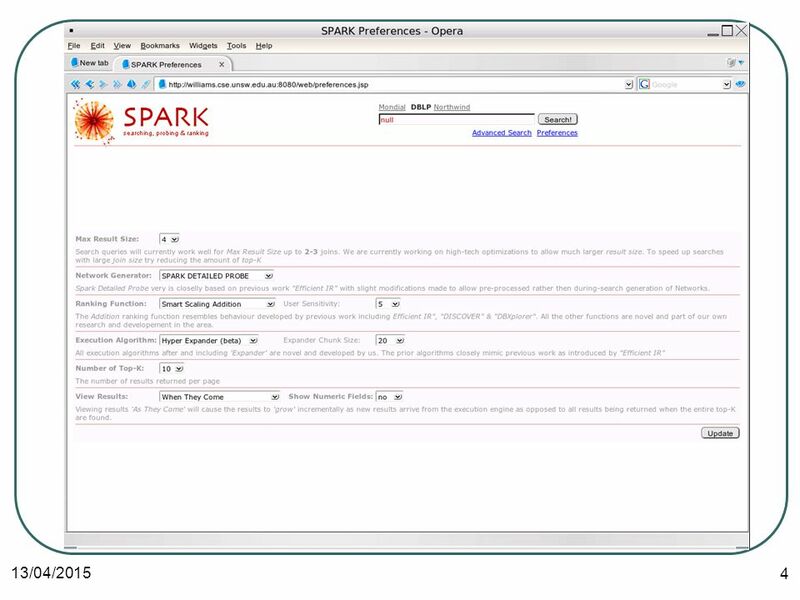 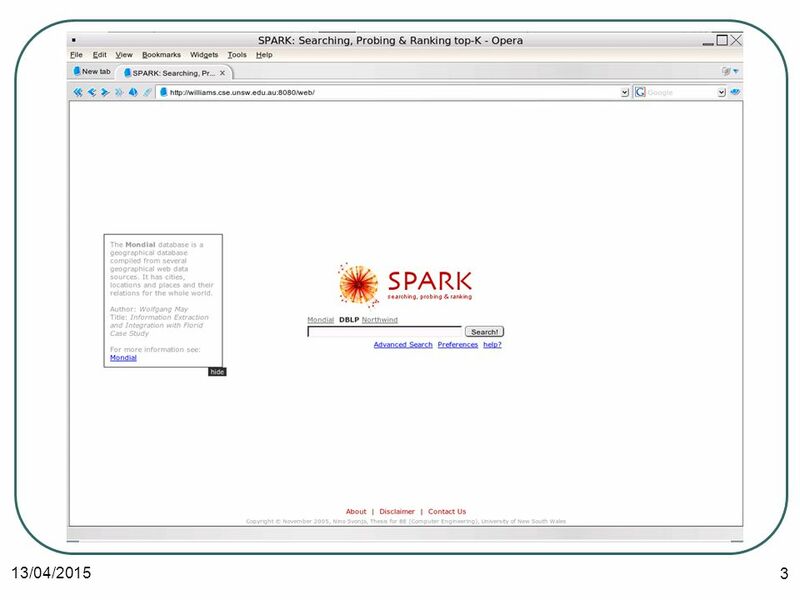 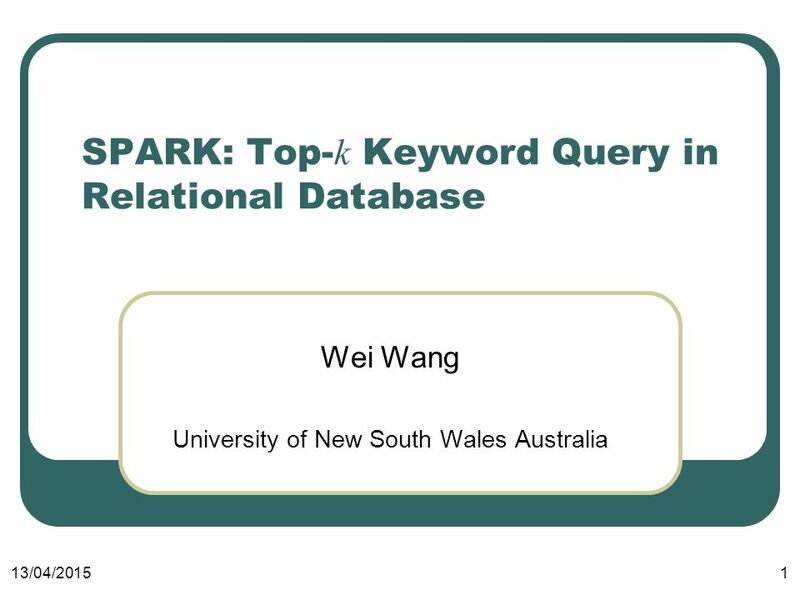 13/04/20151 SPARK: Top- k Keyword Query in Relational Database Wei Wang University of New South Wales Australia. 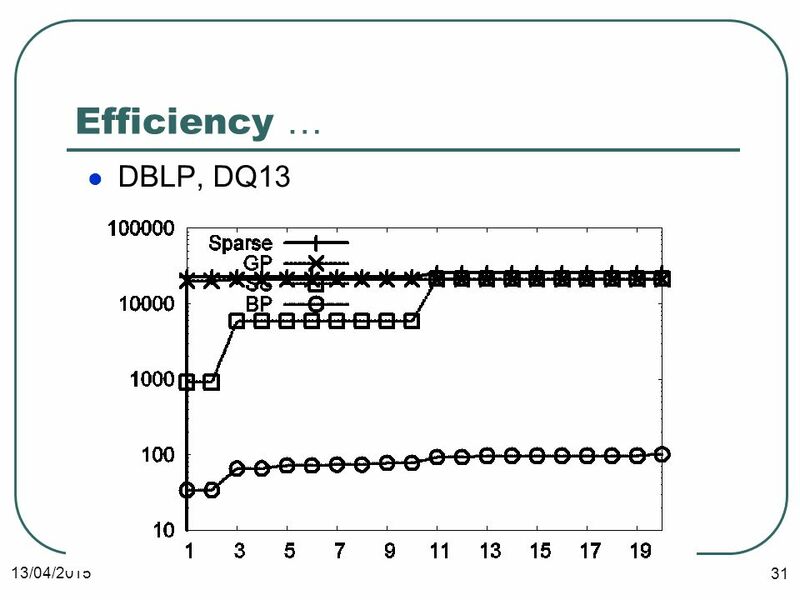 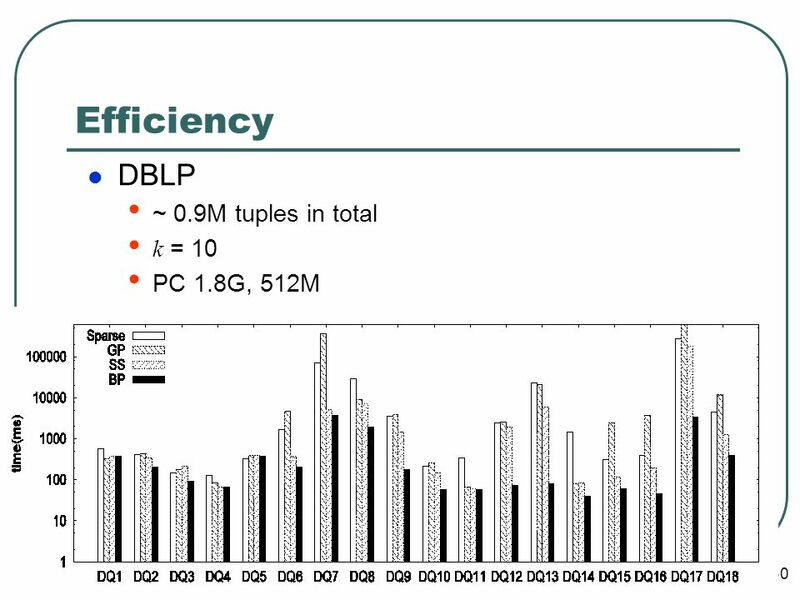 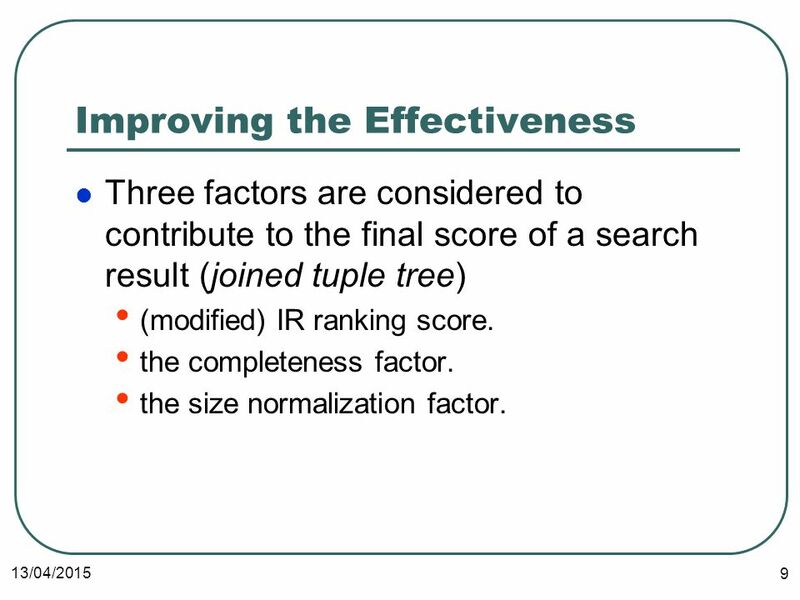 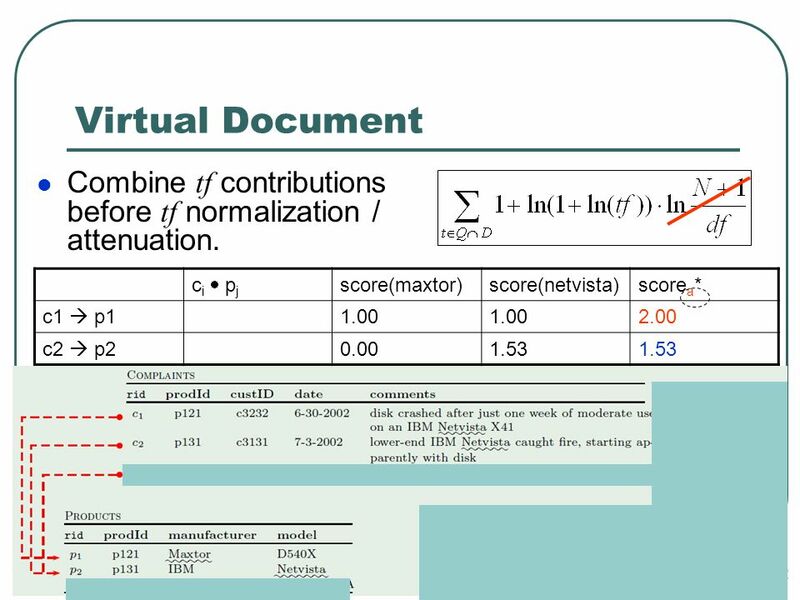 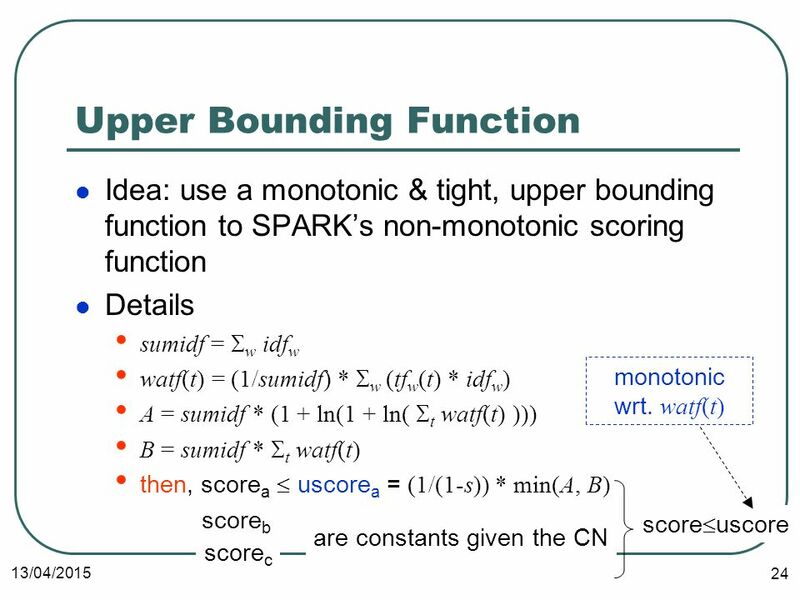 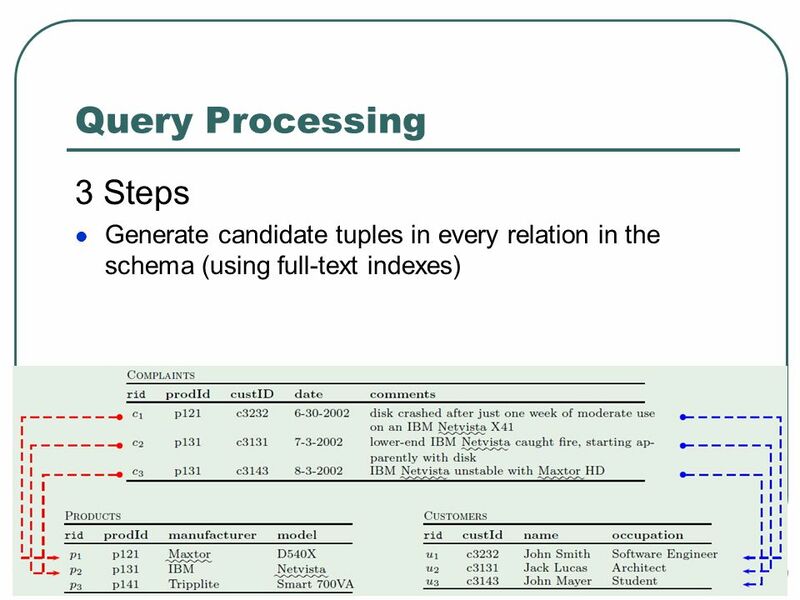 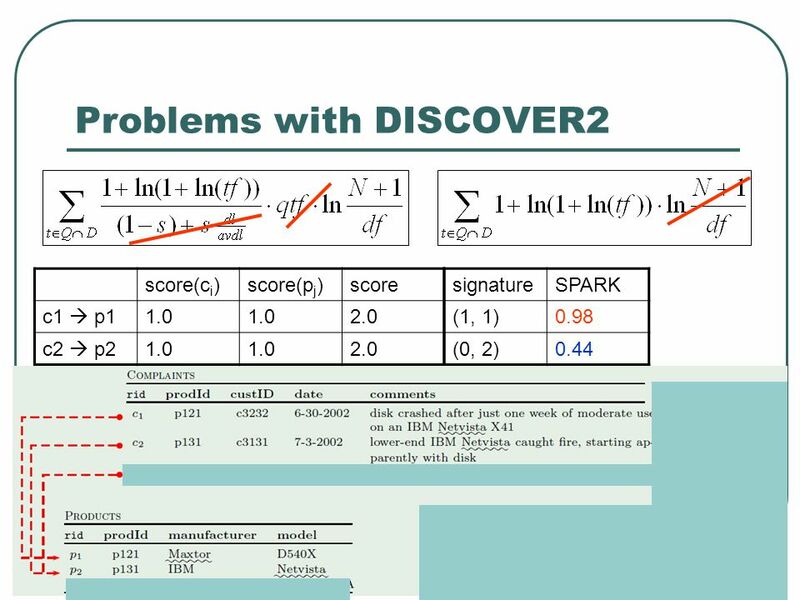 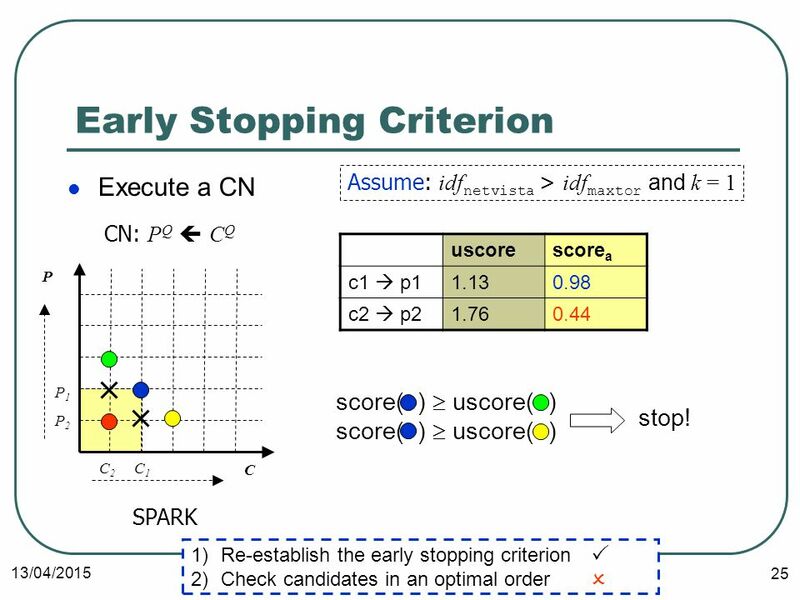 9 13/04/2015 9 Improving the Effectiveness Three factors are considered to contribute to the final score of a search result (joined tuple tree) (modified) IR ranking score. 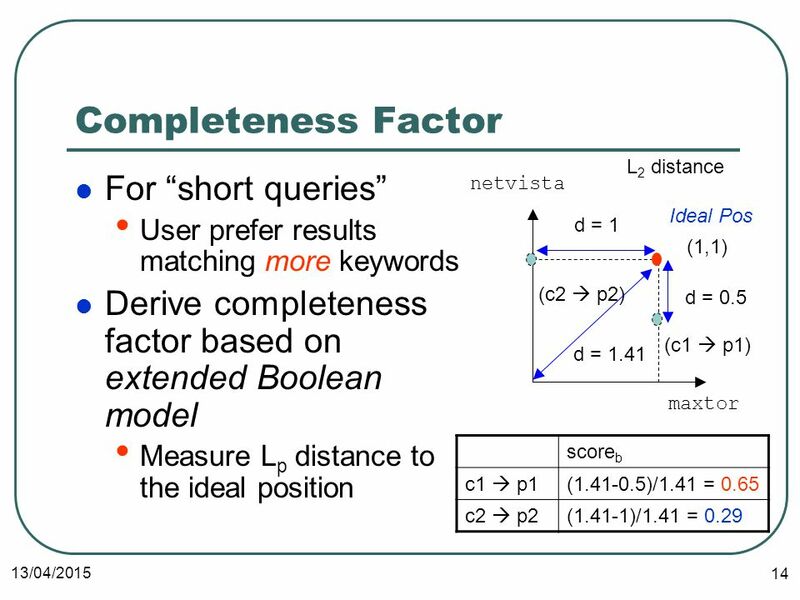 the completeness factor. 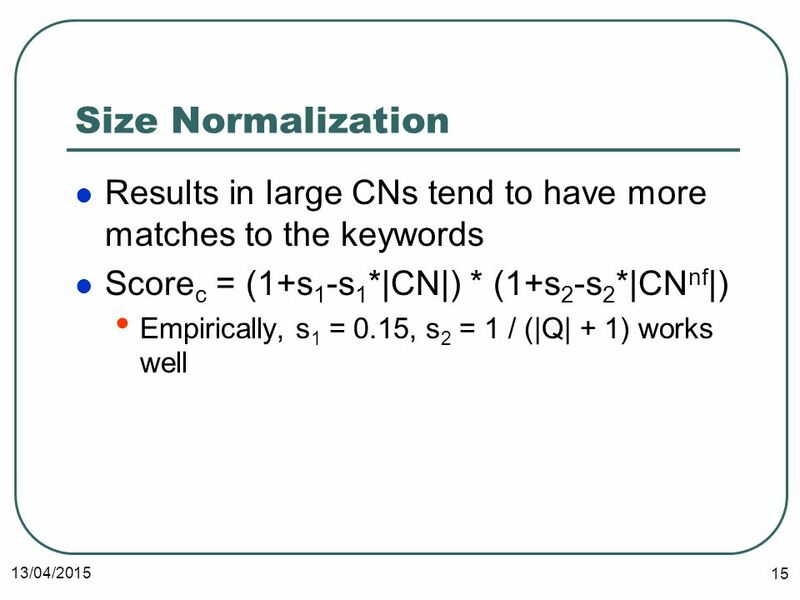 the size normalization factor. 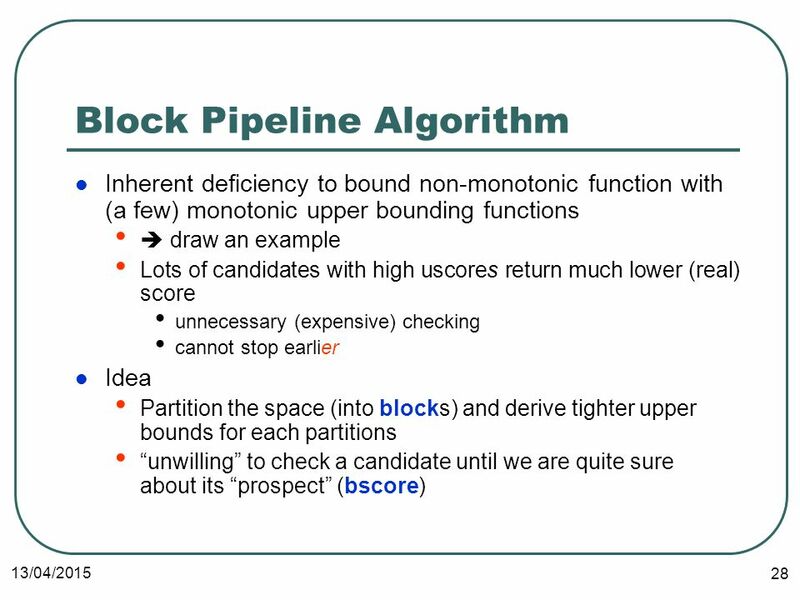 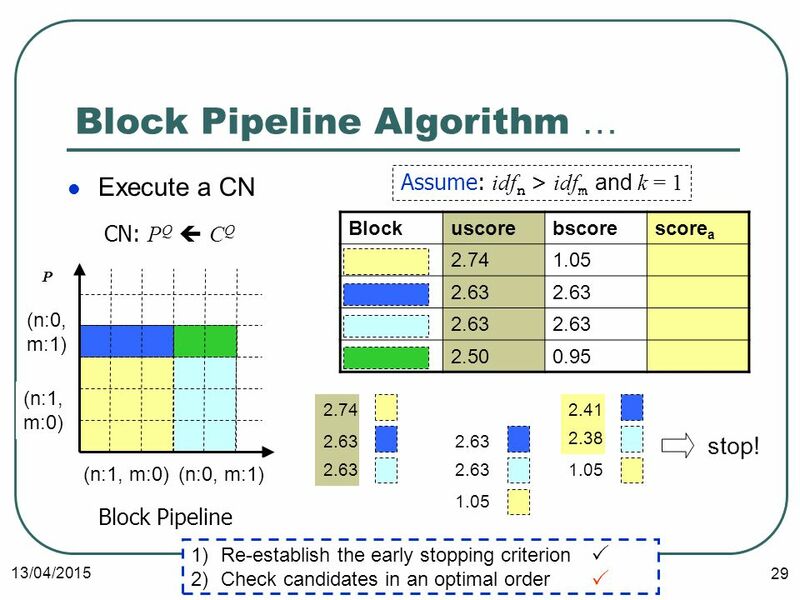 29 13/04/2015 29 Block Pipeline Algorithm … Execute a CN CN: P Q  C Q C P Block Pipeline Assume: idf n > idf m and k = 1 Blockuscorebscorescore a 2.741.05 2.63 2.500.95 1)Re-establish the early stopping criterion 2)Check candidates in an optimal order  (n:1, m:0)(n:0, m:1) (n:1, m:0) (n:0, m:1)  2.74 2.63 1.05 2.63 1.05 2.41 2.38 stop! 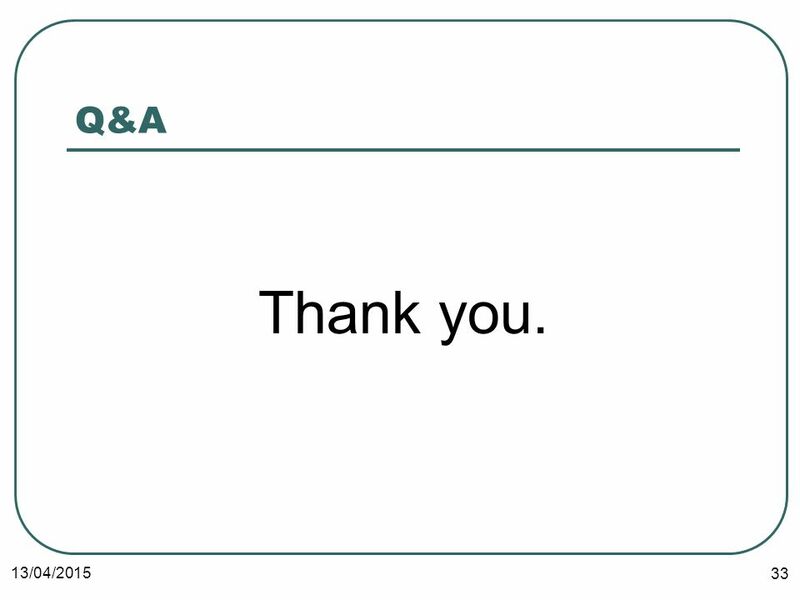 33 13/04/2015 33 Q&A Thank you. 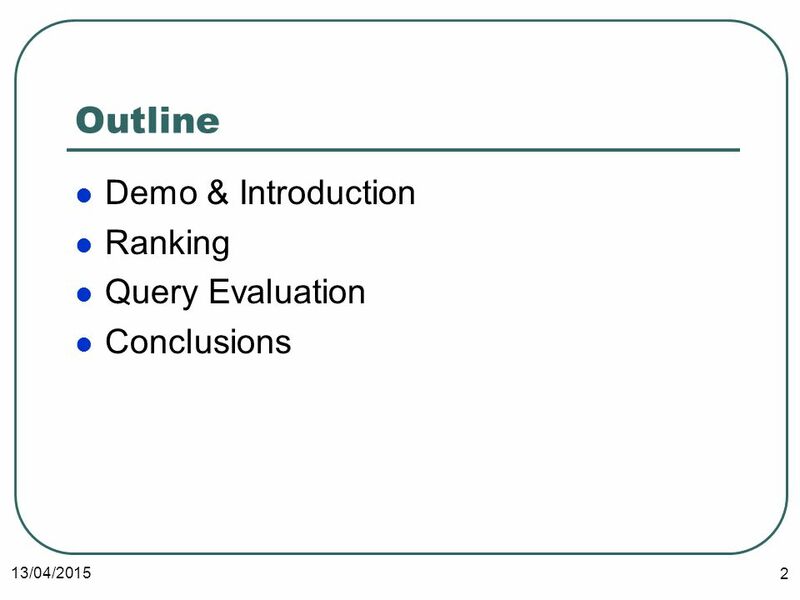 Download ppt "13/04/20151 SPARK: Top- k Keyword Query in Relational Database Wei Wang University of New South Wales Australia." 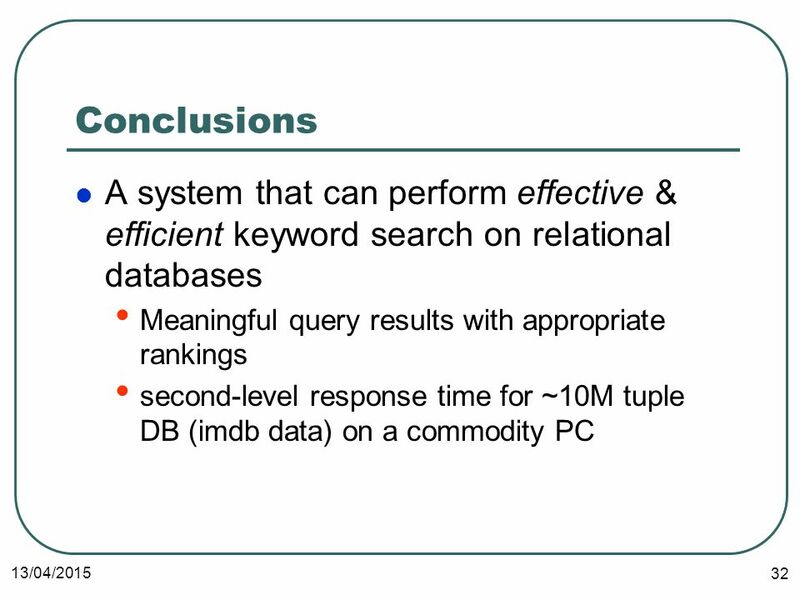 Toward Scalable Keyword Search over Relational Data Akanksha Baid, Ian Rae, Jiexing Li, AnHai Doan, and Jeffrey Naughton University of Wisconsin VLDB 2010. 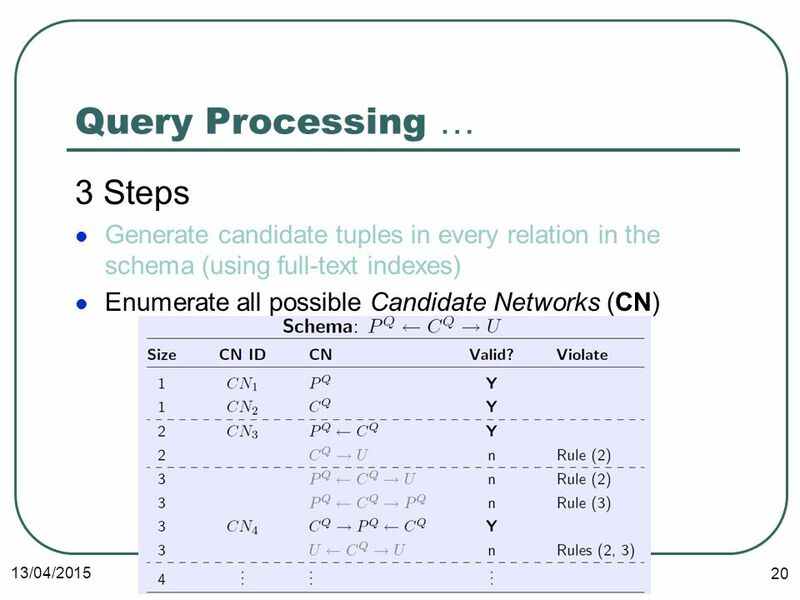 Query Optimization Reserves Sailors sid=sid bid=100 rating > 5 sname (Simple Nested Loops) Imperative query execution plan: SELECT S.sname FROM Reserves. 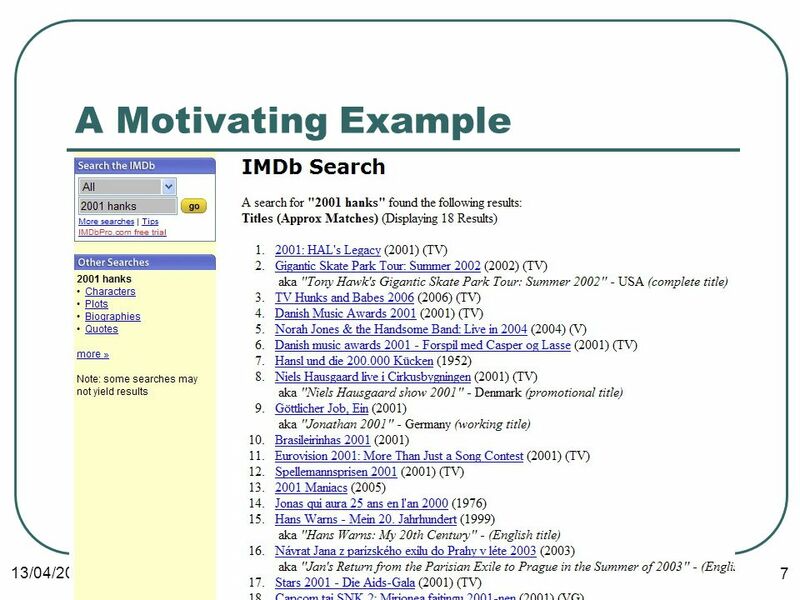 Finding the Sites with Best Accessibilities to Amenities Qianlu Lin, Chuan Xiao, Muhammad Aamir Cheema and Wei Wang University of New South Wales, Australia. 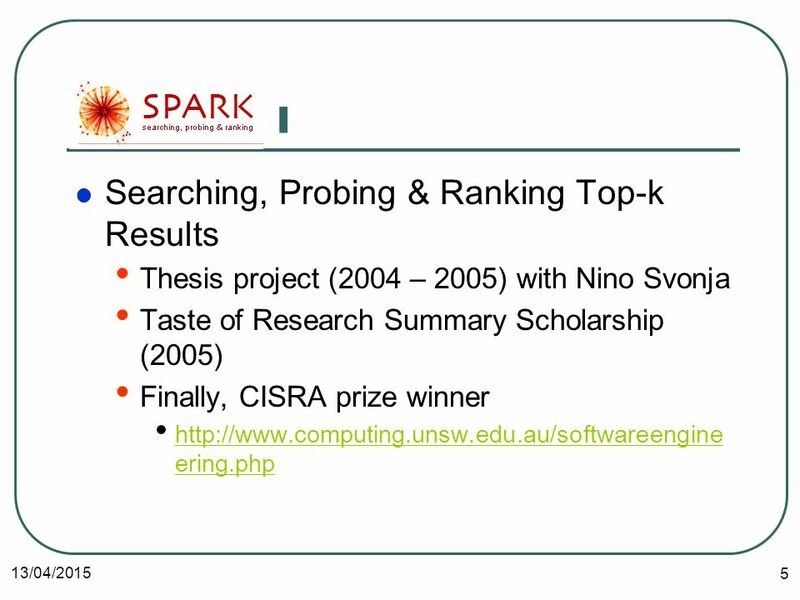 Jianxin Li, Chengfei Liu, Rui Zhou Swinburne University of Technology, Australia Wei Wang University of New South Wales, Australia Top-k Keyword Search. 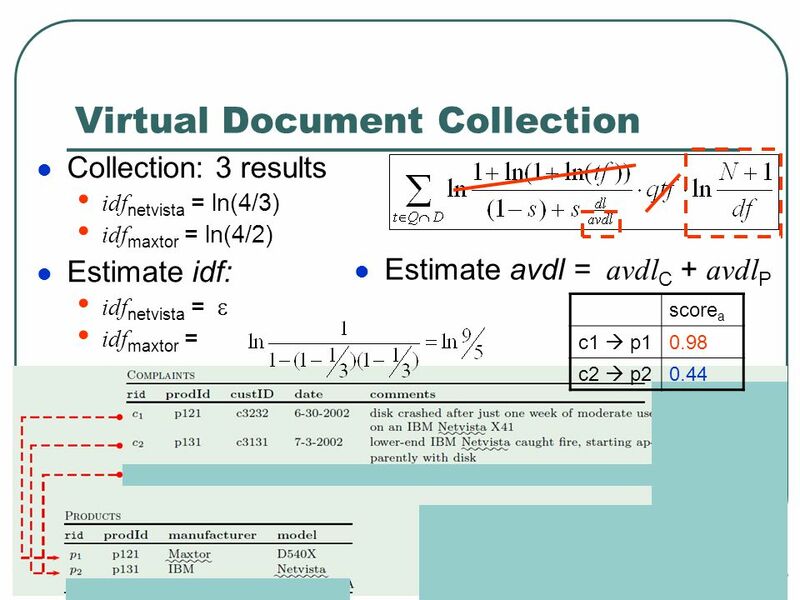 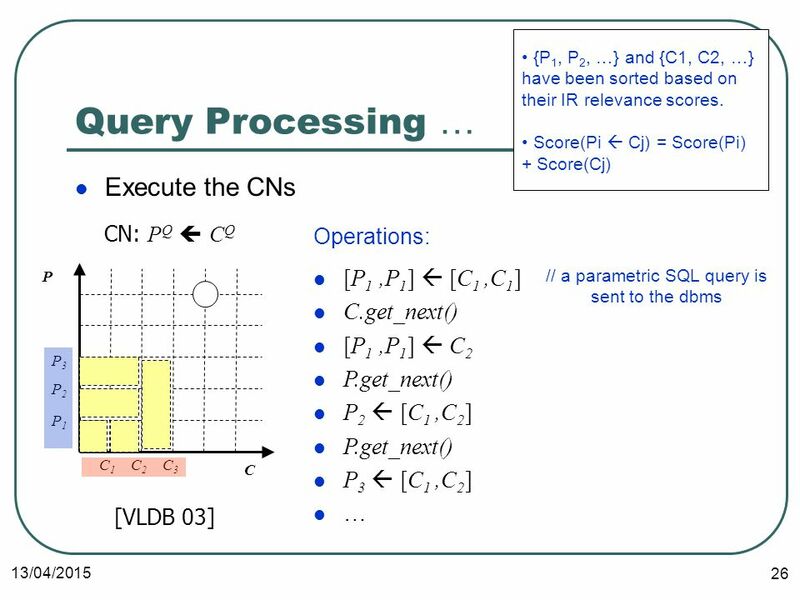 Efficient IR-Style Keyword Search over Relational Databases Vagelis Hristidis University of California, San Diego Luis Gravano Columbia University Yannis. 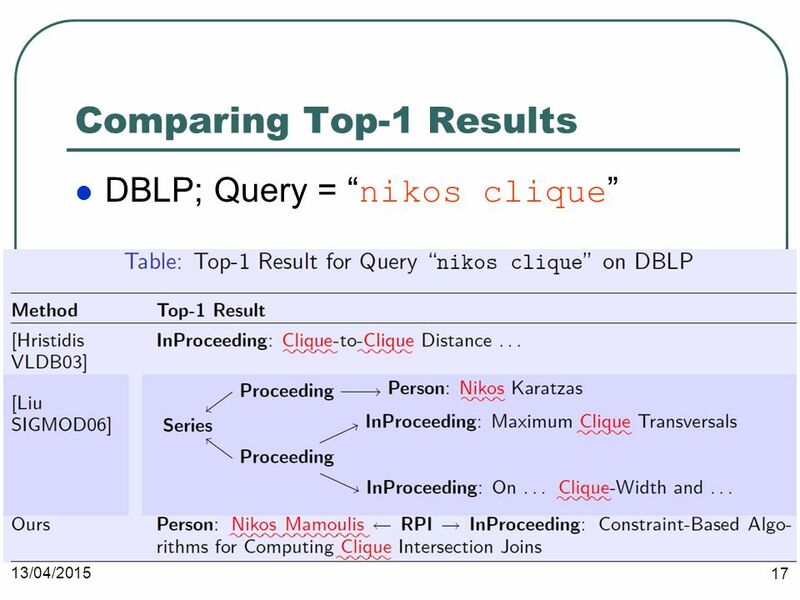 Supporting top-k join queries in relational databases Ihab F. Ilyas, Walid G. Aref, Ahmed K. Elmagarmid Presented by Rebecca M. Atchley Thursday, April. 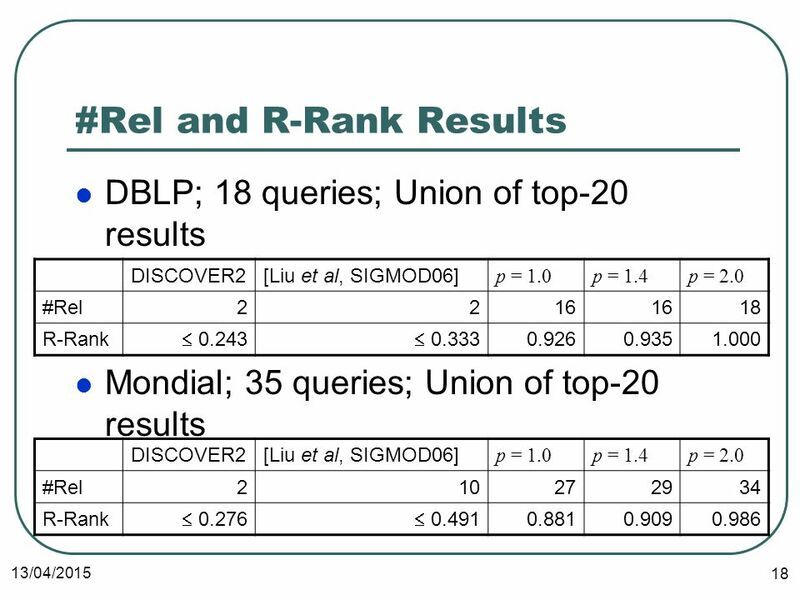 RankSQL: Supporting Ranking Queries in RDBMS Chengkai Li (UIUC) Mohamed A. Soliman (Univ. 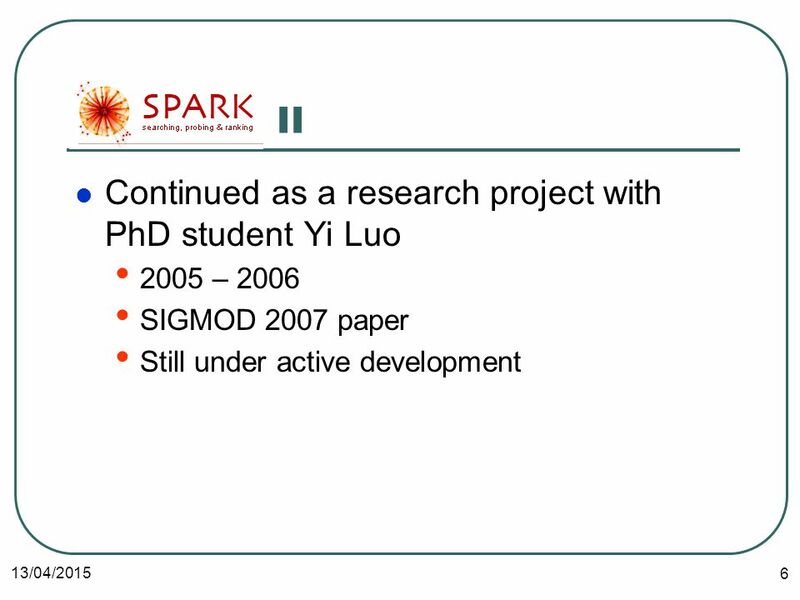 of Waterloo) Kevin Chen-Chuan Chang (UIUC) Ihab F. Ilyas (Univ. 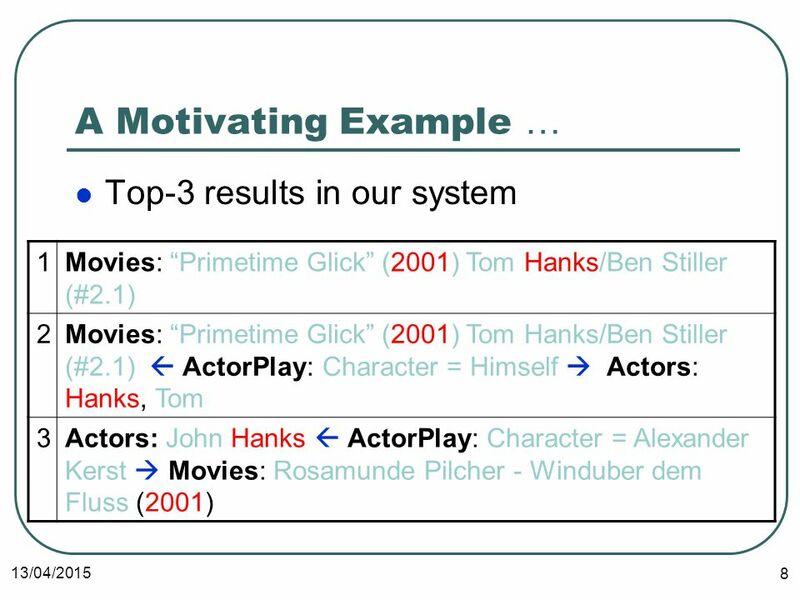 Effective Keyword Based Selection of Relational Databases Bei Yu, Guoliang Li, Karen Sollins, Anthony K.H Tung. 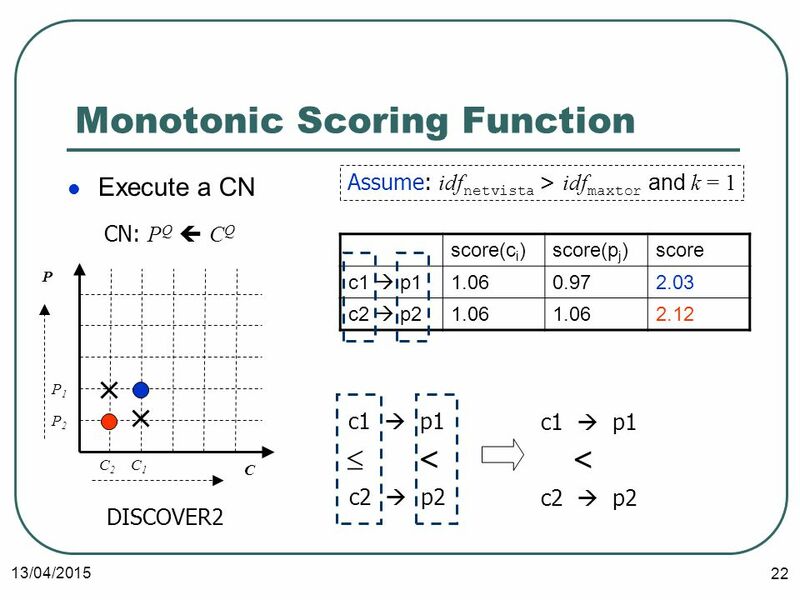 1 Finding Shortest Paths on Terrains by Killing Two Birds with One Stone Manohar Kaul (Aarhus University) Raymond Chi-Wing Wong (Hong Kong University of. 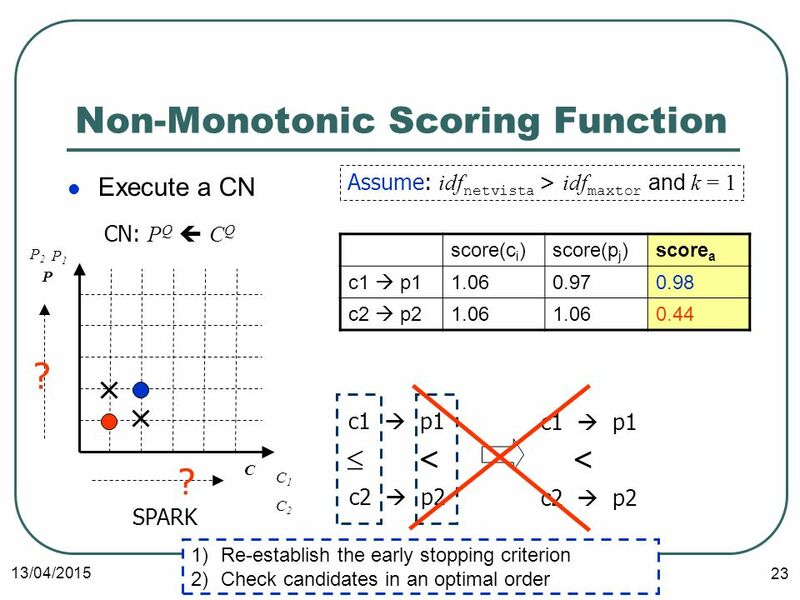 School of Computer Science and Engineering Finding Top k Most Influential Spatial Facilities over Uncertain Objects Liming Zhan Ying Zhang Wenjie Zhang. 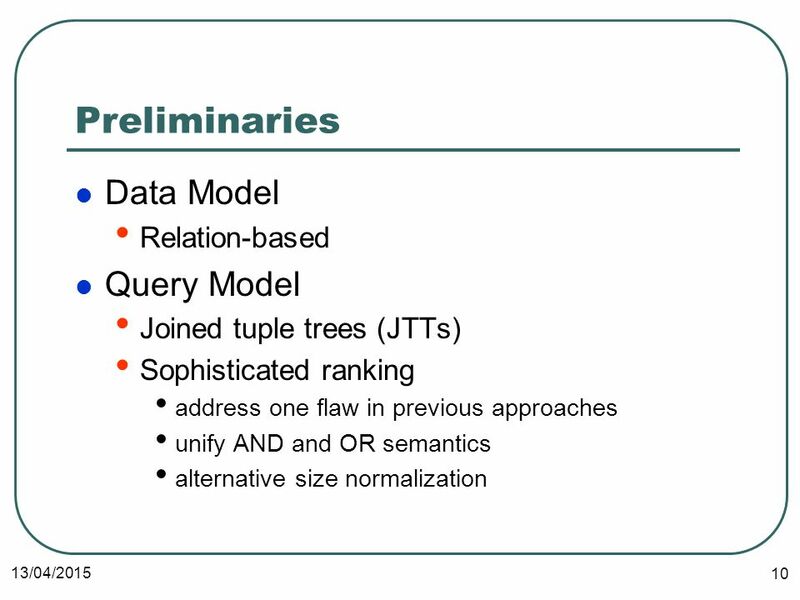 Optimizing and Parallelizing Ranked Enumeration Konstantin Golenberg Benny Kimelfeld Benny Kimelfeld Yehoshua Sagiv The Hebrew University of Jerusalem. 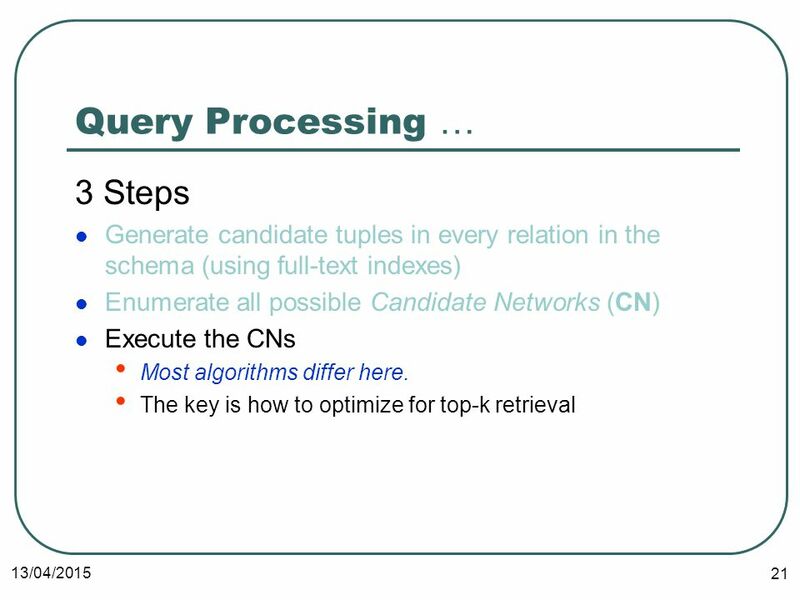 Effective Keyword Search in Relational Databases Fang Liu (University of Illinois at Chicago) Clement Yu (University of Illinois at Chicago) Weiyi Meng. 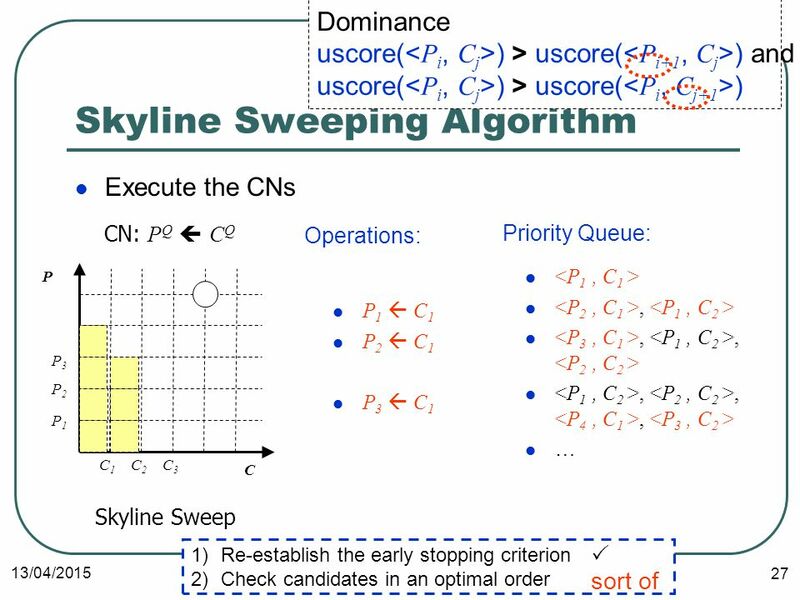 HKU CSIS DB Seminar Skyline Queries HKU CSIS DB Seminar 9 April 2003 Speaker: Eric Lo.